A classic medium to large sized shopping trolley, the versatile, re-manufactured 155tr Shopping Trolley offers a roomy 155 litre load capacity along with a lower load tray for bulky items & supplied as standard with built-in child seat. Fully nestable this model provides plenty of capacity for a biggish shop & will be very popular with your customers. Ideal for supermarkets & convenience stores. This robust trolley remains easy to handle even when fully loaded. Our trolleys have a new triple-layer bright zinc plate finish which will ensure years of corrosion resistant service. As standard we fit new white handles & black plastic accessories & high quality OEM specification castors to each trolley & all come with a 30 Month Warranty. We believe this trolley is of outstanding quality & provides one of if not the best trolley deals in the UK. The 131L Shopping Trolley is an unusual combination of the popular basket volume of 130L and a width of only 525mm. This combination gives the customer the advantage to buy a weekly shop in the larger basket without compromising on space required for the trolleys being used in store. The extra space can be used to add more checkouts or increase the retail space. Extra large 240 litre wire shopping trolley with standard platform suitable for supermarkets, hypermarkets or any sales area. 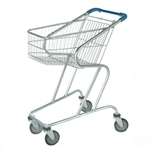 Our traditional metal shopping trolley is manufactured with the best quality materials. Made of wire with an electrolytic treatment, electrostatically coated with clear polyester polymerised. Making it solid, long-lasting, easy to handle with a high quality guarantee according to European Standards. The perfect complement to improve customer's shopping experience. This trolley comes complete with bottle rack, includes plain colour plastics, complete with bottle rack. Inclusive of plain colour plastics. Can be personalised with company logo - contact us to discuss. This popular, stylish re-manufactured 90ltr Shopping Trolley offers a sales boosting alternative to pull-along baskets or hand baskets. This fully nestable model provides plenty of capacity for a generous shop & will be very popular with your customers. With it's shallow, flat basket loading & unloading at the checkout is quick & easy. This trolley remains easy to handle even when fully loaded. Our trolleys have a new triple-layer bright zinc plate finish which will ensure years of corrosion resistant service. As standard we fit new white handles & black plastic accessories & high quality OEM specification castors to each trolley & all come with a 30 Month Warranty. We believe this trolley is of outstanding quality, it represents excellent value for money & your customers will enjoy using it & ultimately spend more. Our most compact trolleys are ideal for use in convenience or department stores and generally any outlet where every square foot of space must be maximized. Alternatively, catering for the shopper with a shorter shopping list, they offer an ideal complement to fleets which mainly consist of our larger trolleys. The 151L Supermarket Trolley is an unusual combination of the popular basket volume of 150L and a width of only 525mm. This combination gives the customer the advantage to buy a weekly shop in the larger basket without compromising on space required for the trolleys being used in store. The extra space can be used to add more checkouts or increase the retail space. A shorter nesting increment A intended for storage and transportation which in the process of unloading from truck or container automatically changes to a longer nesting increment B intended for safe use in a store greatly improves transportation efficiency and reduces carbon footprint. A wide, spacy and easily accessible basket makes the 181L Trolley an ergonomically better and economic alternative to a 130-150L trolley. Point-of-sales processing speed is increased and customer satisfaction improved by speedier throughput at the checkout, and waiting time reduced. The right trolley for discount stores and self-service grocery stores or if used in combination with flatbed Sassy Shopper model, also for Cash and Carry stores. This extra large capacity 'big shopper', re-manufactured 200Ltr Supermarket Trolley offers all the space you need for a big weekly shop. This fully nestable model is supplied complete with plastic seat flap. Ideal in a variety of retail environments including larger supermarkets. This trolley has a classic, robust design with heavy duty chassis & baskets which remains easy to handle even when fully loaded. Our trolleys have a new triple-layer bright zinc plate finish which will ensure years of corrosion resistant service. As standard we fit new white handles & black plastic accessories & new high quality OEM specification castors to each trolley. We can also supply with your own logo and colour choice to the handle for a small additional charge - please call us to discuss your requirements. All trolleys come with our peace of mind 12 Month Warranty. We believe this trolley is of outstanding quality, it represents excellent value for money & your customers will enjoy using it & ultimately spend more. With a large, low level platform, unique extending basket & a maximum load capacity of 300kgs, this versatile, multi-purpose, re-manufactured trolley will prove invaluable on any shop floor be it a Cash & Carry, Garden Centre, Supermarket or DIY store. Finished in the standard, triple-layer bright zinc plated finish, this stylish yet highly practical transport trolley will deliver years of service even when in use outdoors. For small goods the upper 'retractable' basket is ideal, expanding from 48 litres capacity to a generous 82litres. As standard we fit new grey plastic accessories & high quality OEM specification castors to each trolley & all come with our 'peace of mind' 30 Month Warranty. Handle shown on image is for illustrative purposes only. This trolley is the best 'all rounder' in our range & at an unbeatable GBP 105 each we believe it is a great deal. If you need any more convincing call us on 01737 237586. Our high-quality Flatbed Trolley is a lightweight and cost-effective solution ideal for Cash & Carry, DIY stores, garden centres and warehouses. For use internally or externally, the CC30 Trolley is corrosion resistant and can carry a maximum load of 500kg allowing easy manoeuvrability even at full load capacity. A strong steel mesh basket can be added, providing extra storage for smaller items. For more information on the size and specification of these bays, please call us on 01737 237586.